As I walked out of the cinema after watching Jupiter Ascending I thought ‘maybe I’ve watched too much Buffy The Vampire Slayer’. (And then I snorted because that is a ridiculous notion.) When it comes to realistically portraying female characters as strong, believable and fallible, Buffy is where it’s at. And Jupiter Ascending (directed and produced by Lana and Andrew Wachowski) is most decidedly not where it’s at. Mila Kunis plays Jupiter Jones, a young woman living a life of unbearable tedium, working as cleaning woman. Little does she know her ancestry dictates that she play a pivotal role in an interplanetary conflict of epic proportions. 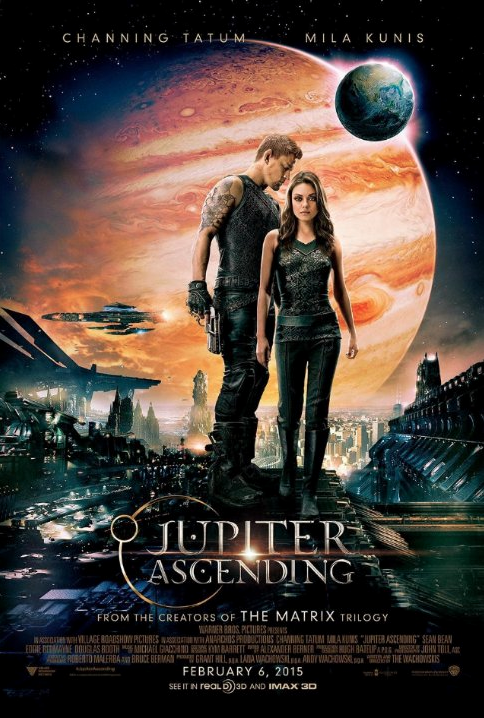 In swoops Channing Tatum (whom I never quite got the appeal of – I know, I’m in the minority) as Caine Wise, a kind of intergalactic warrior sent to protect the mostly helpless Jupiter. Sean Bean and Eddie Remayne join the cast of seasoned actors (both Tatum and Kunis well and truly proved their acting chops in Foxcatcher and Black Swan respectively) as baddies with their own agendas. Themes around over-indulgence and massive consumption are touched on but not really well explored (actually, Cloudy with a Chance of Meatballs did a better job of that). This is a good looking film. The Wachowskis, once filmmakers with the promise of greatness, have in recent years been producing visually stunning films that are a bit light on in believable plot. The Trekkie in me loved the watching all the action sequences in space, but I wanted more substance. If you’re in the mood for a visually exciting film and spunky leads, file this one away as ‘wait until you can rent it out cheaply’ option. I’m no stranger to feminism presenting women with a mass of swirling contradictions. I won’t deny the appeal of being rescued by a spunky and mysterious stranger. It’s a bit hot, but it arguably clashes with feminist ideals. Rather than watching Jupiter be passively carted from disastrous scenario to even more disastrous scenario, it would have been nice to see Jupiter show a little gumption and take control. This entry was posted in Film and tagged feminism, film, film review. Bookmark the permalink.